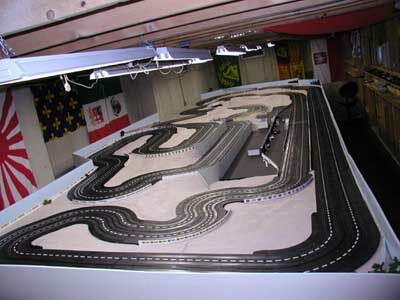 This track is located in Alto Michigan and is the property of real motorsports nut Stephen Thomas. 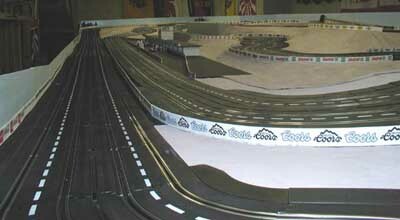 Each lane of this Artin Four lane layout is 170 feet per lap. 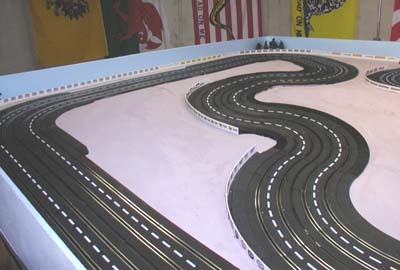 The layout occupies an area 40' by 12' (14' in one 6' spot). Laptimer 2000 is used to count and time laps and with a 16 volt power supply used to give the cars great performance. Jumpers feeds are added every 15-18 feet (300+ feet of wire) to keep the power consistent all the way around. 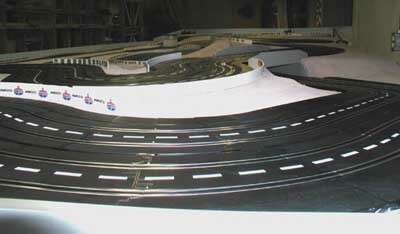 Built into the layout is a number of elevation changes with the highest point 16" above the table surface. Several EZreach car pickers are stationed around the course to ease the marshalling task. The layout surface is made from 1" thick "blue board" with 1/2" blue board supporting the raised track section. The longest straight is 27 feet and the next longest is 21 feet. 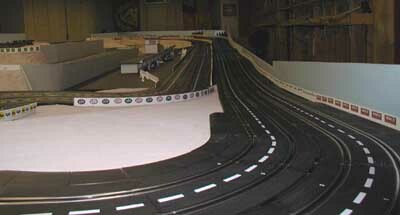 Track record @12 volts with stock RTR Scalextric Mustang is 14.9 seconds. 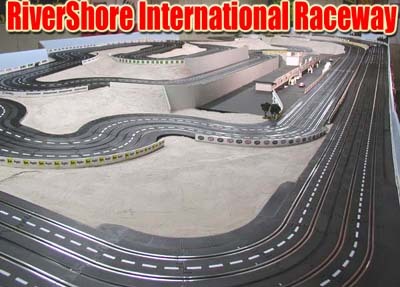 All work was done by Stephen Thomas & the track plan was devised by Frank at Slot Car World.